Ahundred electrodes are pressed tightly against my scalp and a mixture of salt water and baby shampoo is dripping down my back. The goings-on in my slightly agitated brain are represented by a baffling array of graphs on a screen in front of me. When I close my eyes and relax, the messy spikes and troughs become neat little waves. I’m here for a demonstration of the tools underpinning what many call “mind control” technology. Neuroscientists believe it will soon be possible for humans to control robotic avatars using the power of thought alone, or even to send thoughts or intentions from one person’s mind directly into another – a terrifying prospect for fans of cult sci-fi films such as Scanners, where society is controlled by an elite force with mind control and telepathic powers. Greg Gage demonstrates the new ‘human to human’ interface. “Mind control” is suddenly not just plausible, but actually rather easy. You can buy a “DIY human-human interface” online for just over £165, part of a project aiming to make neuroscience more accessible to young people. In one video by neuroscientist Greg Gage, two on-stage volunteers are connected to the device – little more than a few wires, some flashing circuitry and a laptop. When one subject curls their arm, the other is powerless to stop their arm curling too. 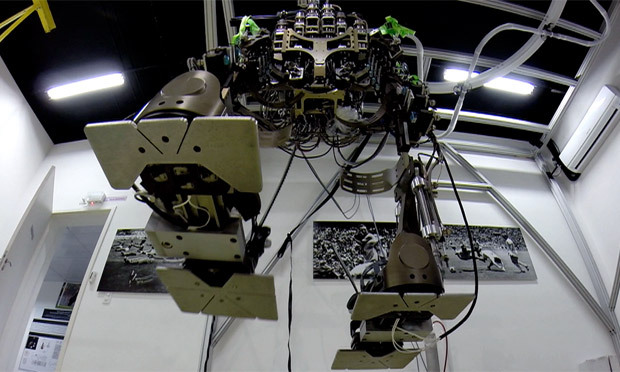 The robotic exoskeleton used at the 2014 World Cup opening ceremony. The answer, at the moment, is almost certainly no. Even the most seemingly profound experiments can be a little underwhelming when looked at in detail. The Barcelona experiment, for example, might sound as if one person thought “hola” and the recipient then heard the word as an inner voice in their head. The reality is very different: the “sender” spelled out the word in binary code by imagining moving their hands or feet – one movement meant “0”, the other meant “1”. The “receiver” then received two types of brain stimulation: one, which caused them to perceive flashes of light, represented the 1s, another pulse with no effect represented the 0s. So, really, one person spelled out a word by thinking about moving, and one person got a kind of futuristic Morse code blasted into their head. Impressive, but hardly The Matrix. ■ Activity in the brain is detected by a device held on the scalp, such as electroencephalography (EEG). This gives an indication of patterns of neural activity, mainly in areas of the outer brain.